On this page I decided to put some electric guitar and gear reviews of things that I happen to own now or owned in the past. Mostly you'll find positive notes about the items, and it's because usually, I carefully reasearch the available information about a product before I commit to buy. Although this instrument is considered as a budget practice electric guitar mostly oriented towards beginners, because of its high quality, great durability, and the rich tone there's no reason not to use it as a relatively inexpensive pro guitar as well, in my opinion. If you would like to leave your own review for any guitar related product you have had experience with, you can do it through the 'Leave a Comment' form, and I'll publish it properly later on. Cort M600T is the most versatile guitar I have owned so far, it provides the possibility to split both the neck and bridge humbucker pickups into the single coil pickups on the fly by pulling up the tone knob. When it's played in the 'humbucker mode' the tone more or less resembles the Les Paul Std Guitar; in the 'single coil mode' the sound is more treble-emphasized and delicate. Two pretty and highly portable guitar amps that easily fit into a daypack. I have both these mini amps for a while now and in this article I'd like to share the pros and cons I learned about them from a real experience. An affordable lightweight effect with true-bypass, treble and bass tone control that delivers mild overdriven tone (not suited for heavy kinds of music). 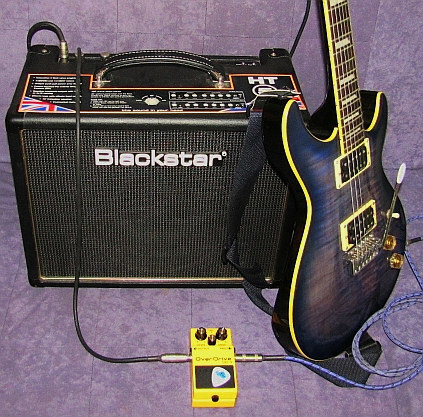 Battery powered modeling guitar amp with effects processor on board. The unit has the conventional guitar effects like: flanger, chorus, tremolo, phaser, delay and reverb; 1 microphone amp mode for singing or using the amp as a loudspeaker; 6 guitar amplifier emulations producing: nice clean; in the way of acoustic-like; lightly overdriven; distortion; and kind of metal sound. Mighty 9V, 1700mA DC adapter that can simultaneously feed a chain of guitar effects. A remedy to scratches on high gloss clear-coated factory finishes, on both electric and acoustic guitars. The page includes the story of how I removed the ugly scratches on my guitar finish using this product.